Below is the third and final recipe from Riceinfo.com. 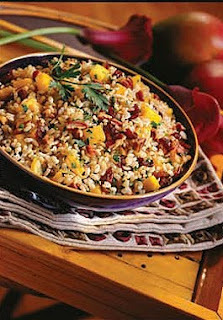 In large bowl, combine rice, cranberries, mango, pecans, pepper, vinaigrette and 1/4 cup parsley. Toss well. Garnish with remaining parsley. Each serving provides 302 calories, 4 grams protein, 10 grams fat, 50 grams carbohydrate, 5 grams dietary fiber, 0 milligrams cholesterol and 281 milligrams sodium. What did you think of this recipes? Do you have any rice recipes? Share them with us by emailing glutenfreeedmonton@gmail.com. Do you want more popular recipes from Riceinfo.com? Just let us know! Hello Abisaac, Good to see your blog is coming along really well. Great recipes...this one looks easy and perfect for spring weather. Good luck. Really delicious. Tried this recipe last night and my kids loved it.